The Doctor reappeared on our television screens tonight after an anxious wait of a couple of months... and he was back with a bang. I had mixed feelings about A Good Man Goes To War (the mid series climax), there were many parts about it that I felt were fantastic but the ending felt a little disappointing and disjointed for me. Maybe I'm biased and I just didn't like how the big reveal was handled or where it was going. However I have to say that on its return, the latest Doctor Who episode pretty much blew my socks off. It started with a hectic drive through a cornfield as Amy & Rory raced to rendezvous with the Doctor (who has as yet failed to rescue Melody); this was immediately followed by the arrival of "Mels", a lifelong friend of Amy who hast stolen a car with the intention of meeting The Doctor. There was a nice bit of foreshadowing here as Mels had driven through the "Leadworth Crop Circle" (the word Doctor inscribed in the corn by Rory's driving as he tried to attract The Doctor's attention), and crossed out the word by driving in a straight line. Foreshadowing as Mels' driving crosses through The Doctor's name. Mels then holds The Doctor at gunpoint and forces the TARDIS crew into an unscheduled journey which results in them materialising in Berlin, 1938 after a stray bullet damages the TARDIS. This ends up being a timely intervention for Hitler who is about to be "given Hell" by a squad of time travelling, miniaturised humans who travel around the universe in a humanoid robot "tesselator" meting out so called justice on history's worst criminals. There are a few moments of humorous awkwardness (as could only happen when you travel through time and inadvertently save one of history's worst war criminals and end up locking him in a cupboard for his own protection), before we discover that Mels has been mortally wounded by a bullet and spontaneously begins to regenerate (honestly Steven Moffat has clearly gone for trecord for the amount of regenerations in a single series), as she takes the familiar form of Alex Kingston, we understand are at the beginning of River Song's story. This is not the River Song we are familiar with however. This River Song is an assassin who is still well and truly under the programming of The Silence and still operating under her birth name of Melody Pond. The Doctor having foreseen the arrival of Melody takes steps to preserve his life... by disarming and hiding weapons; this proves in vain however, as Melody utilises a deceptive kiss laced with a slow acting poison. 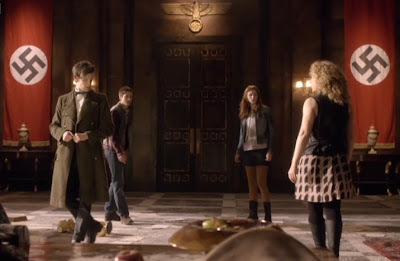 Melody runs away and causes havoc in a nearby Berlin restaurant as Rory and Amy give chase in a bid to apprehend her... closely followed by the tesselator whose crew perceive Melody Pond as a greater threat than even Hitler because she killed The Doctor (as seen in The Impossible Astronaut). As they arrive on the scene of the restaurant they see all the panicked diners fleeing for their lives... in their underwear. Before they are able to act on this however, the tesselator miniaturises them and imprisons them inside itself at the mercy of its crew. The tesselator begins to unleash its punishment on Melody, but is interrupted by The Doctor's lavish arrival and subsequent insistence that this stops. The crew of the tesselator cannot comprehend why The Doctor in his dying moments is displaying mercy to Melody when he possesses the knowledge that she is his murderer. Eventually they ignore The Doctor and proceed to give Melody "Hell". The Doctor in desperation and agony appeals to Amy and Rory to save her... which they do... but this in turn puts them in peril. The Doctor is in so much pain and is so weak that he is unable to do anything to save them... he desperately calls out to Melody to change her ways and save her parents. The TARDIS materialises within the tesselator in the nick of time... but its pilot is not The Doctor... it is Melody who has been taught by the TARDIS (and is indeed also a child of the TARDIS), who has heeded The Doctor's words. As the Ponds rematerialise inside the restaurant, The Doctor's life ebbs away. He appeals to Melody to find River Song and pass on to her his final message and then breathes his last. 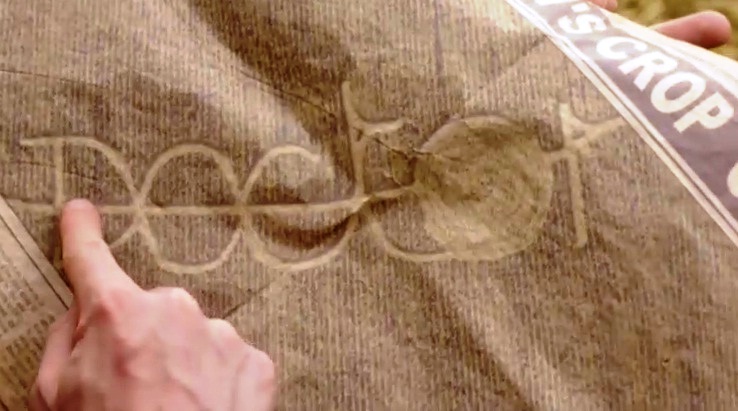 Melody does not understand who River Song is... but Amy uses the tesselator to transmit an image of River Song... which convinces Melody that she is in fact one and the same. Realising the level of her mistake and understanding who The Doctor really is and what he means to her, River draws upon all the remaining regeneration energy inside her body to resurrect The Doctor. "Hello Sweetie." River has a change of heart and brings The Doctor back to life. The Doctor: What do you want with her? Captain: She's Melody Pond. According to our records, the woman who kills The Doctor. The Doctor: And I'M The Doctor... so what's it got to do with you? "For if, while we were God’s enemies, we were reconciled to him through the death of his Son, how much more, having been reconciled, shall we be saved through his life! Not only is this so, but we also boast in God through our Lord Jesus Christ, through whom we have now received reconciliation." In the Bible when a person changes direction... they often gain a new name. Perhaps the most radical example of this is Saul of Tarsus. As much as Melody Pond had been conditioned to kill The Doctor... Saul had been trained to persecute Christians and we first meet him nodding in approval at the stoning of Stephen - the first Christian martyr. After having a personal encounter with the divine Christ, Saul did a complete U turn and became an apostle and apologist for the very belief he persecuted. He became known as Paul. The taking of a new name is symbolic, it speaks of gaining a new identity... one that is free from all the baggage that went before. So in Doctor Who, Melody Pond takes the name of River Song and in the Bible, Saul takes the name of Paul. We too have a heavenly name; we may not know its pronunciation... but it exists nonetheless (this is a theme that Max Lucado explores at length in his famous book "When God Whispers Your Name). We can begin to know it if we listen to God and allow him to work in our lives. In both the case of River Song in Doctor Who... and Paul in the Bible, we see that there is a price to pay in return for our redemption. River passed on all her remaining regenerations in order That The Doctor could live again; Paul realising the great debt that had been paid on his behalf committed his life to God in a very special way. It's interesting that in both fiction and real life, we see a recurring theme - that the price of a person's redemption comes at great personal cost to another... one that usually demands a life. It's equally interesting that the beneficiaries of said sacrifice (be they fictional or actual), often feel an obligation to give something back to the individual or individuals who paid the price for them. What sacrifices have been made for you, that have positively changed the direction of your life? What are you doing or what will you do in response to those sacrifices that honours the person/people who made it? Do you recognise what I consider to be the greatest sacrifice of all and what does it mean to you, personally? These are just some of the questions I hope you reflect on having read this article. If you have any thoughts about tonight's episode of Doctor Who yourself, or if perhaps if anything I have said here has given you something to think about that you wish to share, I'd very much love to hear from you.